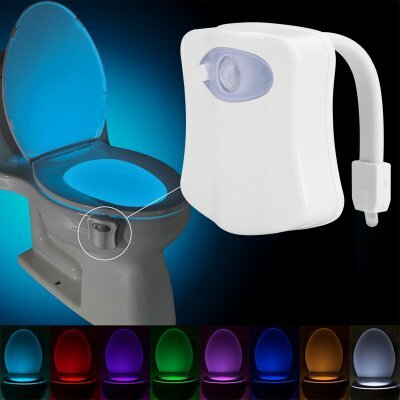 Successfully Added LED Toilet Nightlight - 8 Colors, Smart Motion Detection, Universal Fit, Energy Efficient, Easy To Clean to your Shopping Cart. Turn your toilet into a nightlight – this light-bowl toilet light with motion detection sensor is the perfect fun little gift for a person that already has everything. Letting you choose from 8 different colors this bowl-light is a witty little gadget that, thanks to its universal fit, is suitable for any toilet out there and is guaranteed to make your nightly bathroom visits a lot more convenient, safe, and fun. Thanks to its flexible arm you will be able to bend it into any configuration creating a snug fit for any size and shape toilet out there. Having the option to choose out of 8 different colors you now have the perfect little tool to beautify your toilet bowl and to match it with your bathroom’s décor. Simply select the color you like by a touch of a button or program the toilet light to change color automatically. This witty LED light is THE way to get rid of your boring old toilet and it makes your nightly bathroom trips a lot more safe and fun– making it the perfect gift for men, women, children, and seniors alike. This LED Toilet Light comes with a 12 months warranty, brought to you by the leader in LED lights as well as wholesale electronic gadgets..
We had a small delivery problem but Chinavasion were true to there word and took care of the situation for us. We will continue to use Chinavasion exclusively for our business.